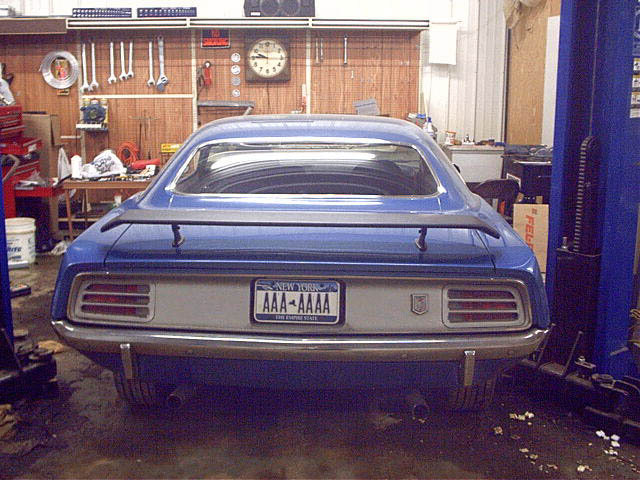 I have always liked the looks of the Go Wing rear spoilers on E-bodies. 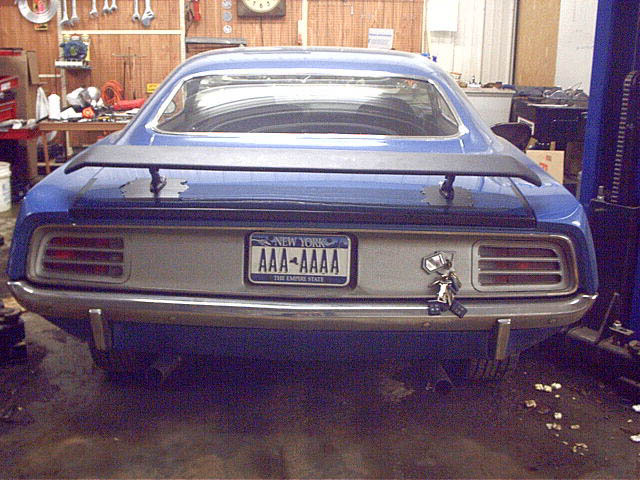 My Barracuda didn't have one, so I decided to add one. (I don't have a problem with this since the long line of previous owners have already modified the car beyond the point where it will ever be original or numbers matching again.) 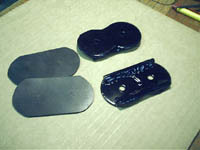 I thought about using a genuine wing, but the cost was just too high and the repro wings are close enough for my needs. 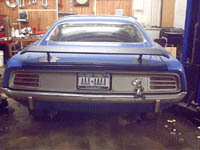 I purchased my wing at the Mopar Nats from First Place Auto Products. Due to the somewhat lacking instructions and the mounting solution not making a lot of sense to me, I wasn't quite sure how it was supposed to be mounted. The wing sat on the shelf for a while and I looked at how other cars had their wings mounted. 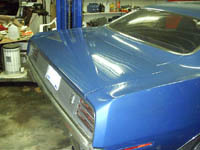 It was then that I discovered that my decklid was different than any others I had seen. Basically the problem is that one side of my decklid has what appears to (possibly, maybe) be a 1971 style cutout, and the other side has no cutout whatsoever. Click here to see a page showing the different mounting styles and my decklid in comparison. Naturally, this had me confused so I thought I would see if First Place Auto Products would have some suggestions for me. I figured with their experience, they might have come across this situation before and would have some helpful hints for me. When I approached them during a lull at their booth at Carlisle, they completely blew me off. The guy obviously couldn't care less about my problem, didn't want to talk to me, and had a strange, bemused attitude about him - as if he was enjoying my predicament! They already had my money, what more did I want from them? I could almost understand this reaction if I had come at them with an attitude or was accusing them of building a bad product, but I realized it wasn't their problem and I approached them for any tips or insight they might have in a very respectful manner. I was completely taken aback at their total disregard for me and my problem. For this reason, I definitely can not recommend doing business with First Place Auto Products - I don't think its too much to ask for a couple minutes worth of "service after the sale". Note: FPAP saw the above comment on my web site and responded to it. You can see their response here. 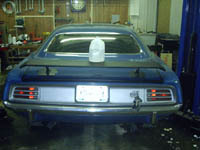 Note: Due to the weirdness of my deck lid, this will not be a "by the book" install. I plan to use the proper measurements and such on the top of the deck lid, but underneath, all bets are off! I plan to come up with an alternative method to secure the wing. 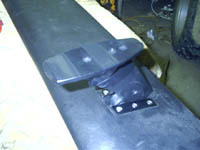 As long as it looks correct up top, and is a secure mounting method, I don't care what it looks like in the trunk where you can't see anyway. Click on any pic to bring up the full sized version. It may take a little while for this page to load, depending on your browser. Its set up as a table, and some browsers wait until the whole table has been loaded before displaying it. 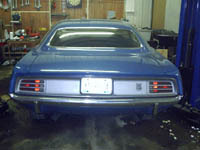 A "before" shot of what the car looks like without the wing. 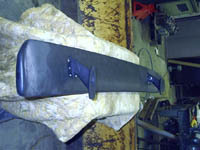 This is the reproduction wing, I have already attached the pedestals to the wing using the supplied hardware. 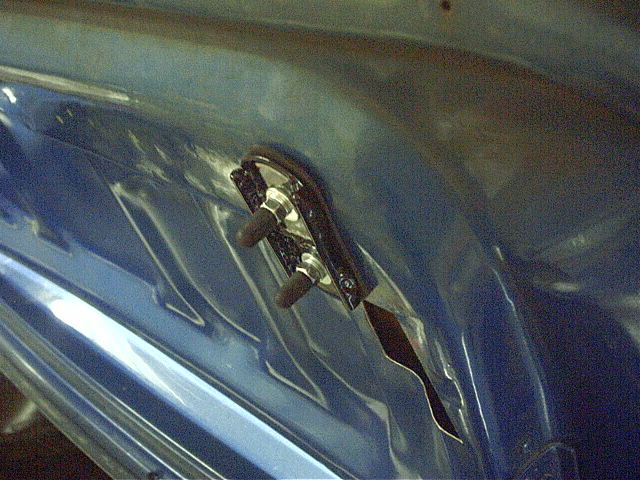 I left my keys hanging in the lock because throughout this install, I needed to open and close the trunk lid many times. I used some more electrical tape to attach the rubber gaskets to the pedestals, in order to protect the paint, should the two come into contact. 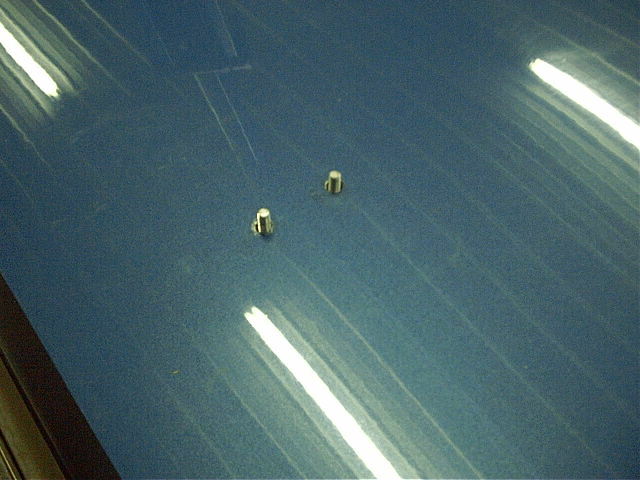 Using the marks I made earlier to approximate the location where the pedestals would sit, I laid down a "pad" of electrical tape to protect the paint finish. 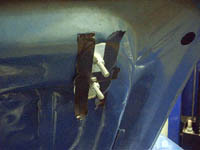 I used electrical tape because it isn't very sticky and would peel off of the paint easily. Also, I didn't have any masking tape handy. I measured in 9 5/16" from the edge of the trunk lid to make a mark at the top and bottom of both pads, and drew a line between them to create a vertical line on the pad. 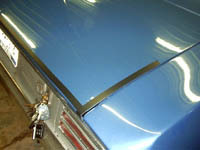 I measured forward 5 5/8" from the back edge of the trunk lid to make a mark on the left and right sides of both pads and connected the marks to create a horizontal line. 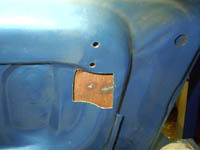 Where they intersect is the location where the rear-most hole must be drilled. From that point, I measured forward 1 3/4" to mark the location of the forward hole. 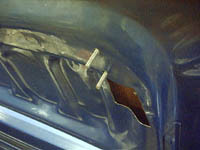 Here, I have taped a straightedge to the trunk lid, basically connecting the two rear-most holes. 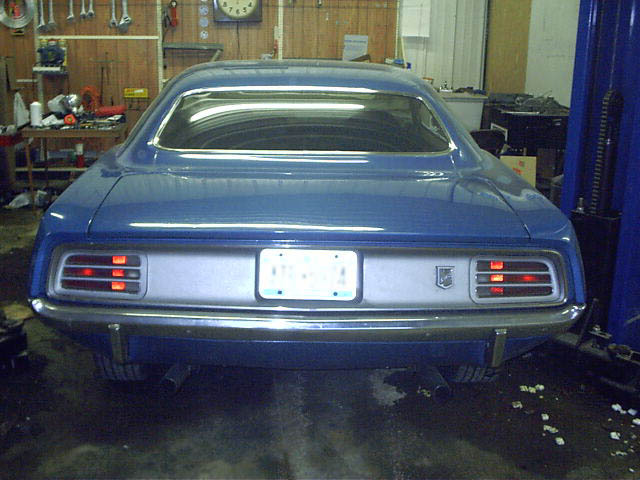 Then I measured from the back of the trunk lid at various locations to make sure the spoiler would mount straight. 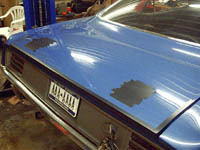 Next, using the marks I had made earlier, I positioned the spoiler roughly in place to be able to get an idea what it would look like and make sure there wasn't a problem with the alignment. The partially filled jug of water balanced on top is to keep the spoiler in place - without it, it would tip off the back of the car. 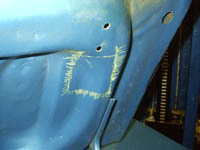 While positioning the wing in place, I noticed that the pedestals were slightly "inboard" of the marks I had made earlier. 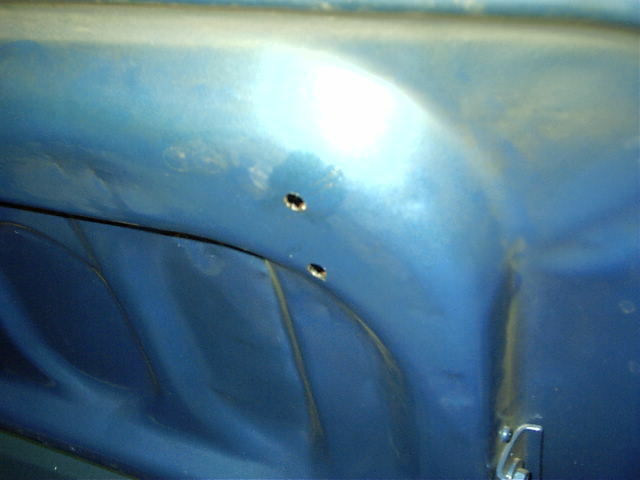 I measured the distance between the mounting holes from pedestal to pedestal and measured the distance between the marks on the trunk lid, and sure enough, the pedestals were somewhere around 1/16" to 3/16" closer together than they "should" have been. I could move the pedestals a bit by hand to make up for some of it, and I also compensated by centerpunching the holes ever so slightly "inboard" from the locations I had marked earlier. This was the really hard part - not physically but psychologically! Putting holes in a perfectly good lid - for better or worse, there's no turning back now! I lightly centerpunched each location (being careful not to hit it too hard and make a depression in the surrounding sheet metal), then drilled a small pilot hole at each location. For some reason, I got a lot of what appears to be body filler! Maybe this trunk lid had a spoiler at one point, and the lid was patched? Next, I drilled the holes out to 5/16"
I used a small phillips screwdriver as a centerpunch, sticking it through the drilled holes in the top skin, making a small dent in the underskin. 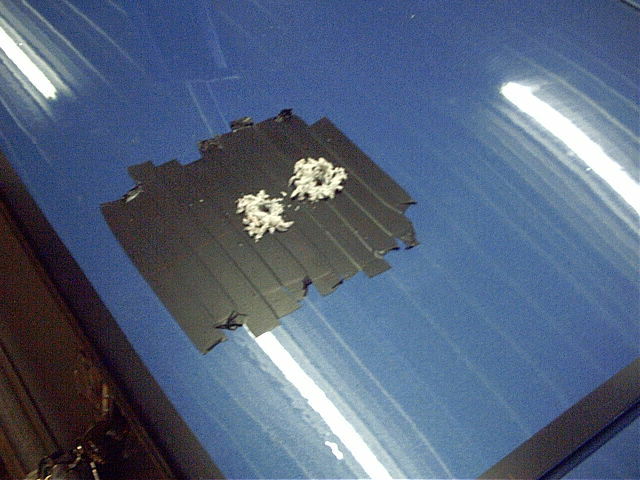 Then, using a bit smaller than 5/16", I drilled through the bottom skin from the top. 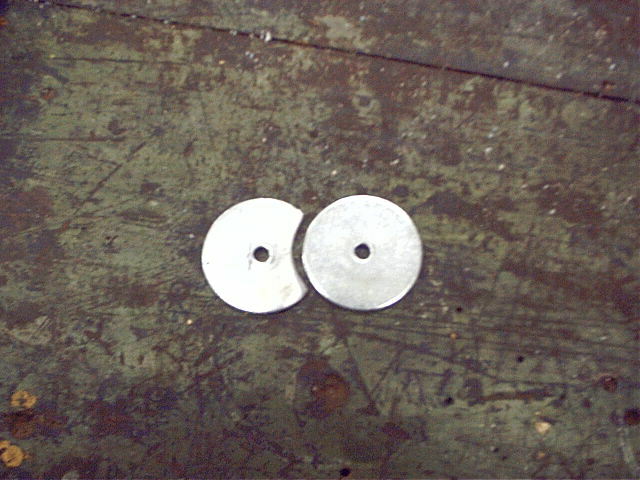 (I used a smaller bit so as to not widen the 5/16" holes in the top skin.) Then, I used the 5/16" bit from underneath to open up the holes in the bottom skin, and a countersink bit just to clean up the jaggies. 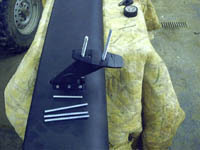 I inserted the four threaded rods into the bottom of the pedestals and set the wing in place on the car. 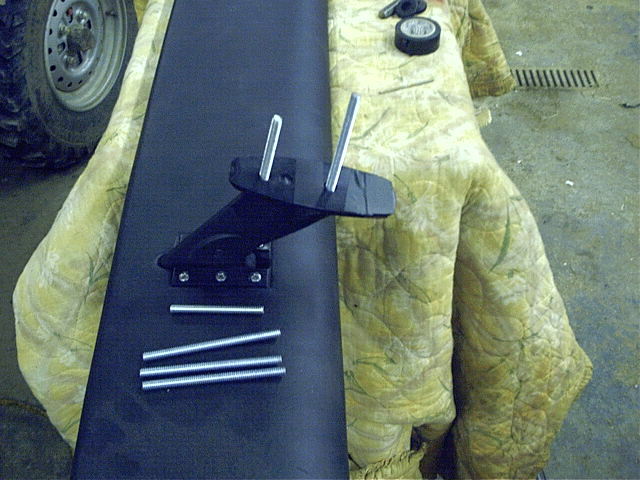 The rods that came with the wing aren't actually long enough to go through the bottom skin to be able to put any bolts on them or anything, but they were enough to hold the wing more or less in place so I could take a picture. Next, I need to figure out exactly how I am going to fasten this thing down! I bought a 1/4-20 threaded rod at a hardware store and cut 4 pieces, each one about an inch longer than the rods that came with the wing. (I believe they came out to about 2.5"). 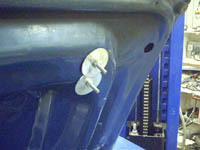 You can see the difference in the picture - the rod to the right in the pedestal is obviously one of the new ones. I replaced all four rods with the longer ones I made, now there is plenty of thread to play with. It wasn't very easy to get the rods down through the top skin and the bottom skin, they don't come out of the pedestal straight. So, I opened up the holes in the bottom skin a bit, which helped a lot. 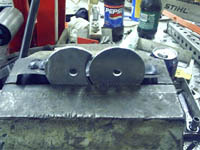 Next, I bolted a couple of 1/4" fender washers in place. 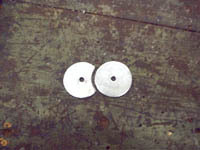 (each washer is 2" in diameter). I then scribed a line on the bottom washer. I cut out that section using a jigsaw, and after cleaning it up with a grinding wheel, this is what I had. 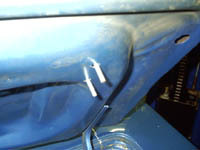 I then bolted them back in place, and taped them together in order to ensure they did not move relative to each other, then unbolted them. 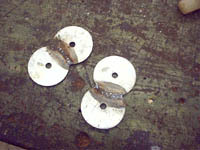 This is the underside of the washers - the tape is holding them in the proper location relative to each other - I need to weld them together without moving them. This gap is a bit wide - I went a bit too far with the grinder. 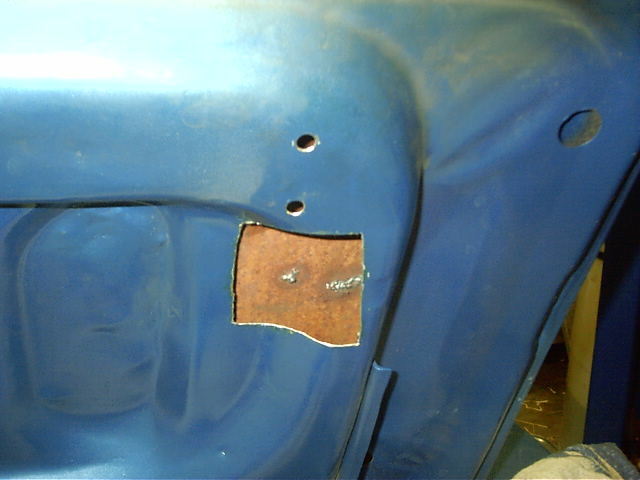 But, I was able to fill it with weld. I decided to add some cross-bars to beef them up a bit. 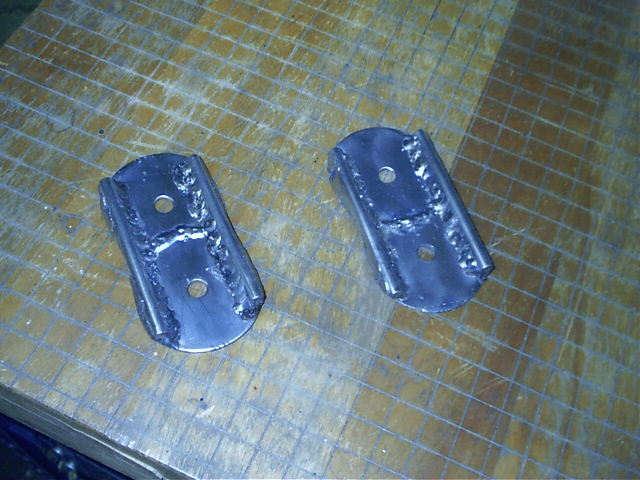 I went a little crazy with the welder - I probably should have just welded the outside of each bar. A coat of mirror black powdercoat should keep 'em from rusting. 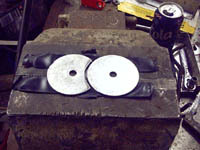 I also cut a pair of gaskets out of some scrap rubber I had laying around. I got to doing some thinking, and I realized that just running a bolt throught the bottom skin would pull down on the top skin and would constantly be trying to "dent" it in. I figured a better way would be to reinforce that top skin and prevent the bolt from pulling down on the top skin. 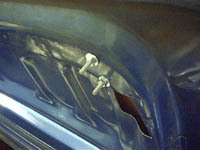 In order to do this, I would need access inside the trunk lid. No problem on the left, but there was no cutout on the right. Using a piece of paper, I made a rubbing of the cutout on the left, using the two holes I drilled as the key. I then cut it out, flipped it over, and marked the area on the right. Unfortunately my air nibbler is out of service at the moment, so I made do with a 3" cutoff wheel, then cleaned it up a little with a grinder and a file. 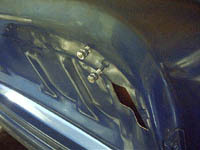 Here is how I plan to mount the wing. 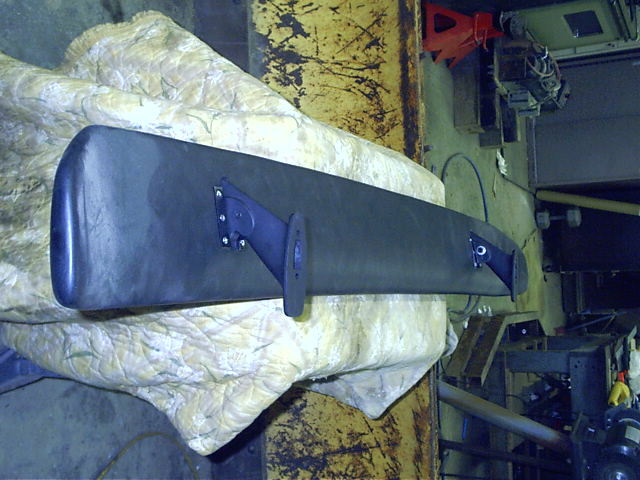 The pedestal will be on top, with the gasket under that, then the top skin of the trunk, then a lock nut (provided with the wing), then a nut, lock washer and washer to go against the bottom skin, then under the bottom skin, a rubber gasket, my bracket, a washer, lock washer, and nut. 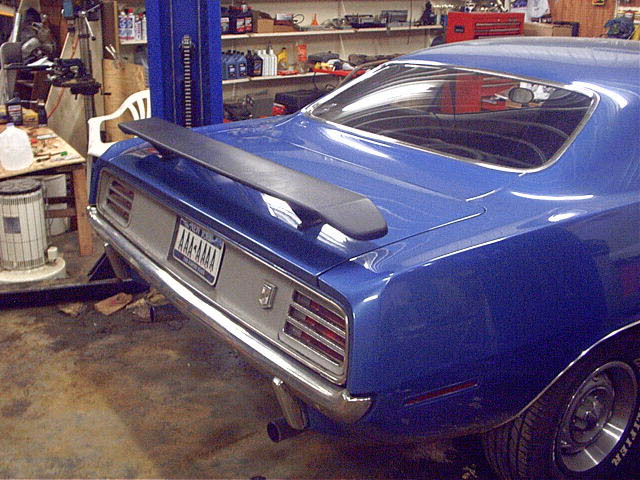 After trying to install the wing a few different ways, this is how I finally did it... First, I removed the electrical tape "pads" on the top of the trunk lid. Next, I put the studs in place, and put all the hardware "between the skins" in place. This allowed them to just hang there. Then, I positioned the wing (and pedestal gaskets) on top of the lid, and started each of the studs into the pedestal by hand. Next, I tighted a couple of nuts against each other underneath the lid, and used a wrench to finish driving the studs all the way up into the pedestals before removing the nuts from the studs. 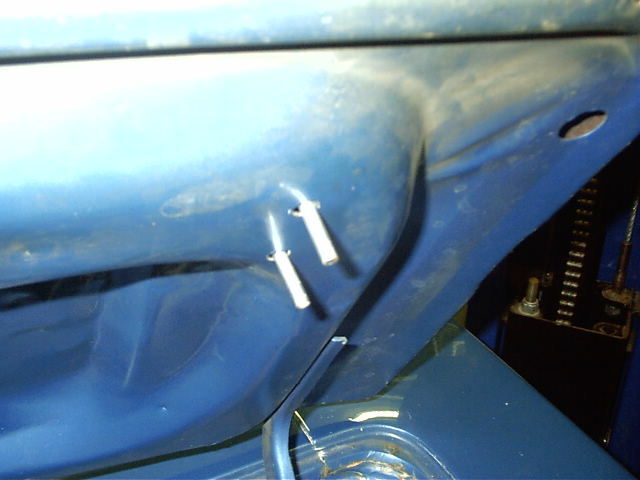 Next, I put a washer and nut in place on each stud and used them to draw the wing down into the top skin, allowing me to tighten the nuts that support the top skin as much as possible. 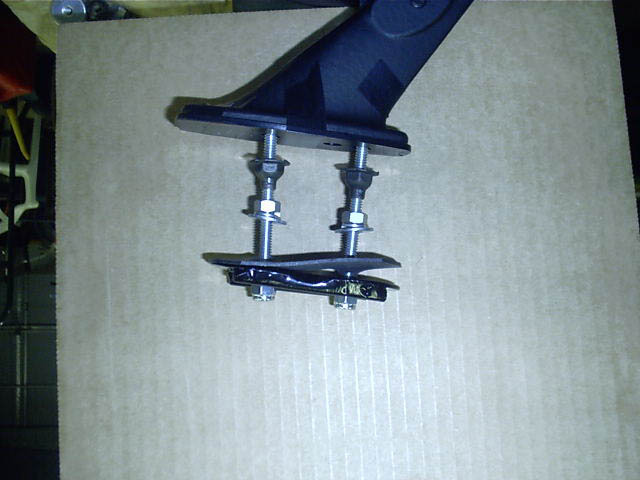 The last thing I did was to adjust the angle of the wing using the allen bolts on the pedestal. I'm not sure if there is a "correct" angle or not, I basically just played with it until it looked about right. This was certainly an unconventional install - but if any of you are in the same boat, hopefully this will help you, or at least give you some ideas. 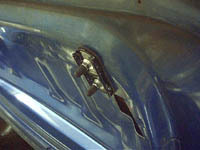 It would have been nice to be able to just bolt it on, but that just wasn't possible in this case. 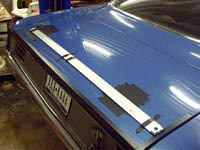 Looking at the "correct" way to install the wing, it is my belief that this method is every bit as strong (if not stronger). 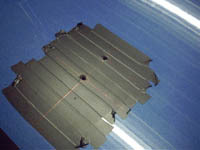 Both methods use the bottom skin for support, and both provide support to the top skin to help bear the weight of the wing. 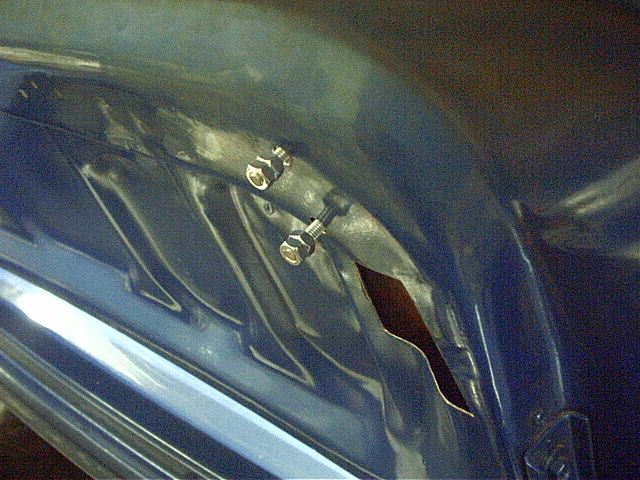 The bracket used for the "correct" install is much thinner than mine and attaches to the bottom of the deck lid using only a few sheet metal screws. IMHO, the way I ended up doing mine is actually stronger. Well, that's another project in the bag! I think its about time to install those 440 hockey stripes to complete the 'Cuda look!